Take Your Teams To The Next Level! 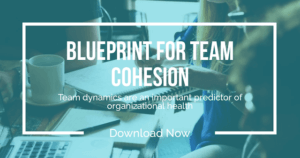 The Blueprint for Team Cohesion is a free e-book that explains how teams can achieve things like higher levels of trust, more productive communication and more impactful results. Fill out the form on the left to get it now. How does an organization raise employee engagement by 33% in just one-year? Download the Blueprint for Team Cohesion to find out. Just complete the form on the left. Teams that work well together perform better (and they are more fun to be part of). To achieve this advantage, teams must dedicate effort towards mastering five specific behaviors. Take your teams to the next level! Download the Blueprint for Team Cohesion and get started.